Work with Ballwin, Missouri's Robert's Electric. Electrical Snafu Leaving You Frazzled? Bring in a Ballwin, MO electrical contractor. An unreliable electrical system can be incredibly frustrating, especially when it throws a wrench in your daily routine. Robert's Electric can provide prompt, effective solutions to any electrical problem! We'll examine your electrical system's components to pinpoint the problem. Our team will determine the most cost-effective repair or replacement solution and get your system restored before you know it. We are fully licensed and insured in the counties of St. Louis and St. Charles. We are also licensed to serve the city of St. Louis. You'll be able to rest easy knowing all of your electrical work is guaranteed! 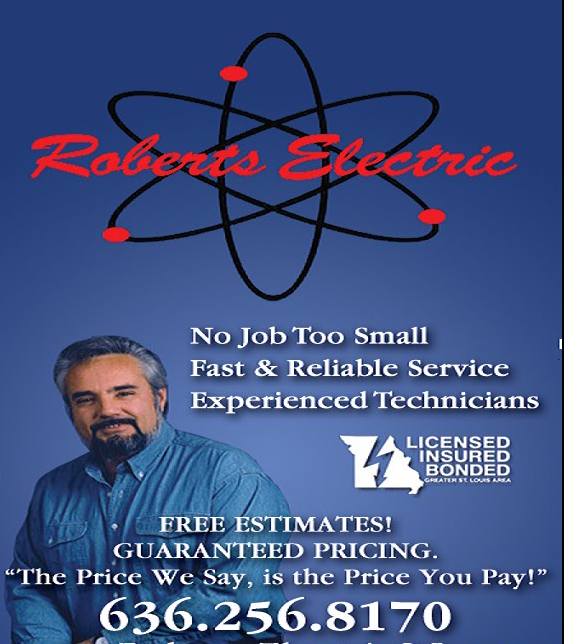 Get in touch with Robert's Electric to schedule your next service. No matter the size or the scope of the job, our expert electricians have you covered. Schedule an appointment by calling Robert's Electric of Baldwin. Finding a quality electrician in the Ballwin or St. Louis, MO areas can be difficult. Luckily, Robert's Electric is just a phone call away! We have decades of experience handling electrical installation, wiring and repair work. Our electrical contractors will ensure that your electrical work is handled safely and effectively. You'll never have to worry about future costly repairs when we're on the job! See what we can do for you by contacting Robert's Electric.